"Mellow Meadows Alpaca ranch is home to 33 alpacas with some pretty impressive pedigrees in many colors, white, fawn, brown and black. Many of the young ones are for sale and they are spectacular. Having been raised on a farm I always missed the country during the time I lived in the city working and raising my kids. After my kids were grown up and on their own I decided to return to western Oklahoma to spend time with my Mom and raise alpacas and sheep. As a child I was intrigued with the idea of spinning wool into yarn as described in fairy tales like Rumplestiltskin and Sleeping Beauty however I didn't know anyone who spun.I now enjoy raising alpacas and shetland sheep and making yarn and felt from their wonderful fleeces. I would like to promote sustainable organic industry and the arts of spinning, felting, knitting , crocheting and weaving. 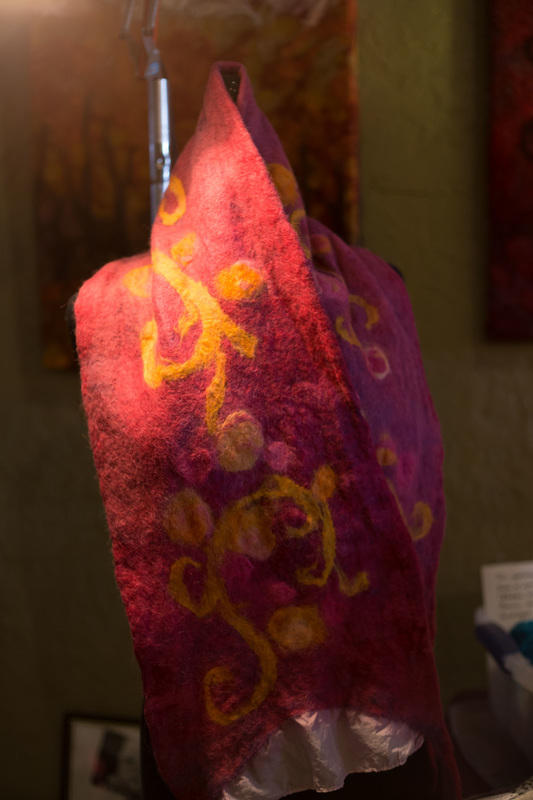 Felting is probably the most ancient form of fiber art and is extremely versatile. It is satisfying to experience something that our primitive ancestors used and which is still useful and creative today."